We now know that the architects who will design our new Forest Hill Pools development are Roberts Limbrick Ltd. They seem to be fans of Thomas Aldwinkle’s legacy of Victorian civic buildings (he designed Forest Hill pools, Louise House and the library.) Roberts Limbrick are currently working on the refurbishment of another of his pools, Kentish Town Baths. 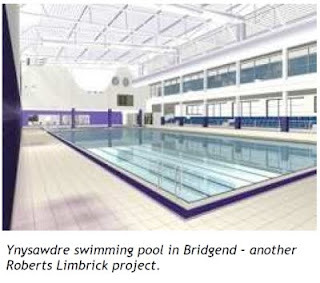 They have also designed and built a number of other modern swimming pools for Local Authorities in and around London including the Mile End Leisure Centre. When we got in touch to congratulate them on being selected for this project they wrote back to say they were “delighted, and indeed excited, over our selection for this prestigious and important project in Forest Hill.” More information about them can be found at www.robertslimbrick.co.uk. The rest of the design team is WYG who’ll be the Structural Engineers and Building Services Partnership Ltd who’ll be the building services engineers. The Council’s programme for delivering the pools envisages that the design team now spends the next few months working up the final designs prior to the submission of a detailed planning application in April of next year. Construction would then start in June 2011 and the pools would open in December 2012. We are keen to ensure that the detailed proposals are consulted on as they are developed. There are though a number of key issues we’d like to be resolved during this process. How will the Pools frontage work with Louise House and the Library? Is it possible to use this area to provide a coordinated entrance to and between each of the buildings, ideally one that doesn't require disabled users of the library to use the back of the building? Will the internal arrangement of the building work for the widest range of people? How will the building impact on its closest neighbours? We are hoping that the next stakeholder meeting will be used to focus on these issues and to start to refine a scheme that will really benefit Forest Hill Town Centre and become a well used destination for residents.